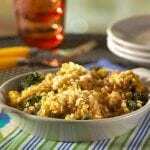 Cheesy Broccoli Bake | JPMA, Inc.
Rice crisp cereal gives a crispy crunch to this classic casserole. In 2-quart saucepan, melt margarine. In mixing bowl, combine cereal and 1 tablespoon of the margarine. Set aside for topping. To remaining margarine in pan, stir in flour. Add milk, stirring until smooth. Cook over medium heat until mixture boils, stirring constantly. Continue cooking and stirring 1 minute longer. Add cheese, stirring until melted. Remove from heat. Stir in corn. Place broccoli in bottom of 10 x 6 x 2-inch (1 1/2-quart) baking dish. Pour sauce evenly over broccoli. Sprinkle with cereal topping. Bake at 350° F about 25 minutes or until thoroughly heated and cereal has browned.